Ekiti Re-Run Saga: Egnr.Segun Oni Pay NIbn for 2 Wards…As Pressure on REC intensifies...Arrest of Opposition Commence 9 days to fresh polls. Basking from the euphoria of melee generated by the N300m induced one day resignation of Mrs. Adebayo, the Action Congress and its candidate, appears to be temporarily out of options and under government scrutiny. While the ousted PDP governor, Segun Oni strategizes his scheme to regain his mandate. Report made available to huhuonline.com make public that the embattled ex-governor is anxious, and eager to part with a considerable sum of money, to regain his mandate, a text message from a cellular phone allegedly owned by Egnr. Segun Oni, who is from Ifaki-Ekiti, in Ido-Osi Local Government Area, reveals that a whooping sum of N1bn was offered to the Inspector general of police, Michael Okiro, however, the monies are laden with the conditionality that the IG will facilitate PDP victory in two wards in Oye- Ekiti. But, this appears to be a mission impossible, considering that Dr.Kayode Fayemi, AC gubernatorial candidate, is from Isan-Ekiti, and a defeat is tantamount to trouncing him in his own backyard.Huhuonline.com contacted the embattled Engr. Oni, but did not receive a response as the time of filling this report. Our check reveals that the registered voters in the two outstanding wards in Oye LGA is 18,000 , curiously more than about 7,000 registered voters in 10 wards in Ise-Orun Local Government Area, where elections were held last week, with AC leading. Recall that Oye-Ekiti is home to PDP Senator Ayo Arise who was arrested by police and flown to Abuja last Saturday, in respect of violence connected with the stalemated re-run elections. Huhuonline.com gathered that Michael Okiro, whose tenure elapses soon, requested Segun Oni to make N200m available to the Ekiti Commissioner of Police and the commander of the Mobile Police unit (MOPOL) to ensure that the will of the PDP was carried out to the letter. Okiro reportedly wants N500 million for himself. Friday, PDP led federal government commenced its plot to win Ekiti at all cost, and withdrew security detail attached to former Ekiti State governor, Mr. Ayo Fayose, who is regarded as a stumbling block or trouble maker. Simultaneously, Mr. Bamtale Oguntoyinbo, the ex- chairman of Oye Local Government Area and member of Ayo Fayose Foundation and Movement (AFFM), who is believed to have massive following in the two disputed wards, was whisked away by security agents at his residence in Oye-Ekiti. According to one Dr. Alarape, Director of Pulicity and Research of AFFM, the former governor had exposed and blocked all plans made by the Peoples Democratic Party (PDP) to rig the last Saturday rerun gubernatorial election in Ekiti in favor of Segun Oni. The new development is a reprisal. Continuing, Alarape said because PDP was desperate to rig the twice-postponed rerun in Oye Local Government Area of the state, prompted the botched plan to arrest Fayose at the premises of AIT in Abuja last Thursday by the security agents. The AFFM spokesman also disclosed of some ballot boxes which had been stuffed with thumb-printed ballot papers in preparation for the rerun in Oye. He said the project was executed in Ibadan in the house of a local government chairman. 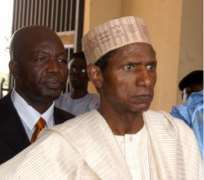 Alarape berated the PDP-controlled Federal Government, saying these things can only take place in a primitive society presided over by President Umaru Musa Yar'Adua. He said Fayose was fighting the cause of Ekiti people who collectively gave their mandate to Kayode Fayemi as their preferred governor, saying, no amount of harassment, arrest and intimidation could silence the former governor. Our findings reveal that the inconstant Ekiti State Resident Electoral Commissioner, Mrs. Ayoka Adebayo, aka mama is under severe pressure to change her stand on the disputed results from the rerun election in the state. Adebayo absconded on Monday, resigned on Tuesday, alleging clandestine attempts to manipulate the results in Ido-Osi area of the state. But in a dramatic twist, rescinded her resignation on Wednesday. Recall that her resignation threw the authorities into panic, prompting the Inspector- General of Police, Mike Okiro, to give her 24 hours to report to the police or the Independent Electoral Commission (INEC). She, however, emerged on Wednesday and withdrew her resignation letter after a close-door meeting with the INEC chairman, Prof. Maurice Iwu. Sources told huhuonline.com that the INEC boss is spearheading the intense pressure on the Ekiti REC to accept the counterfeit results from Ido-Osi, which she had earlier rejected. It was learnt that the matter featured prominently at a meeting of the National Electoral Commissioners in Abuja with the Ekiti REC during the week. Iwu was said to have requested her to return to Ekiti and announce those disputed results, over which she had resigned. But her stand, we gathered, is to return to Ekiti any moment and organize fresh election in Oye. According to her plan, the fresh election may hold tentatively next Saturday April 9. She had rejected the Ido-Osi results because the votes from eight of the 11 wards were allegedly collated at a police station contrary to the provision of the Electoral Act stipulating that votes must be collated at INEC designated centers. Besides, the results were not signed by any agent. At the Abuja meeting, Mrs. Adebayo was said to have firmly stood her ground that she would, on no account, accept those fake results. Her stand was that violence stopped the election in Oye and that the Electoral Act is clear: anywhere violence impedes elections, the results should be cancelled. Our sources said the Ekiti REC had a solid ally in one of the National Electoral Commissioners who advised that the woman should be allowed to carry on according to the provisions of the law and the dictates of her conscience. The commissioner, who is said to be a lawyer, reminded the meeting that by law, only the tribunal can change the decision of the REC.